Attempting to integrate the technology with an EHR? For a smoother implementation, follow these eight tips. Bombarded with an unprecedented number of requests to learn and adopt new technologies, many physicians are overwhelmed and frustrated. A growing number of studies reveal that in the race to achieve meaningful use incentives, many health care organizations either have not made optimal technology choices or have experienced lackluster deployments. Results from a 2013 survey conducted by the American College of Physicians and AmericanEHR Partners that tracked the opinions of thousands of physicians across multiple specialties revealed that user satisfaction with EHRs fell 12% between 2010 and 2012. Meanwhile, a survey by Black Book Rankings suggested that 2013 would be the “year of the great EHR switch” because users are dissatisfied with the technology’s functionality and how it integrates into workflows. In recent years, the promise of speech recognition to help the industry overcome productivity woes and create more efficient workflows within EHRs has been a focal point of activity. And while speech recognition has proven its ability to deliver on this promise in numerous environments, many bungled deployments have resulted in poor adoption rates and lack of return on investment. While industry experts agree that speech recognition has an important place in the future HIT landscape as a tool for improved efficiency, organizations need to draw from others’ successes and failures to achieve an effective rollout. To reach optimal efficiency, experts recommend eight best practices that can bolster plans to integrate speech recognition into EHR workflows. • What is the existing environment? • What additional infrastructure is necessary? • How will speech recognition help meet planned objectives? “If you have all the details in a project plan and present it to all those who will be impacted, things seem to go so much smoother,” Crandall notes. Richard suggests that physician champions can come from any position, but the choice needs to center on a professional who wants to have control of an effective documentation strategy and is willing to get the job done. 3. Consider simultaneous rollouts. Because EHR workflows can vary, experts suggest that, if possible, health care organizations may be best served by deploying their EHR and speech recognition workflows at the same time. “You really can’t separate the two. If you want to have speech recognition work in the best way possible, you need to have EHR workflows working the best way possible as well,” Fritsch explains. Richard points out that there are pros and cons to EHRs and finding where speech recognition fits into workflow and where it doesn’t is critical to a successful rollout. “When we go into a hospital, we look at the EHR and try to find out where the narrative falls in and whether there is anything we can do to add to the efficiency of how it works,” he says, adding that while speech recognition is designed around the narrative, EHRs tend to be more structured from a content perspective. If not properly assessed, this variance can complicate speech recognition use. As the industry works to bridge the gap between structured content and narrative, the process will become a little more seamless, according to Richard. Vendors also can help assess infrastructures to determine any gaps that may exist before moving forward with a speech recognition project, according to Crandall, who points out that when speech recognition is deployed within a local environment, the technology requires a fair amount of resources. In fact, in some medical practices, the technology may not meet the necessary standards. “Performance can be a problem sometimes or the technology simply won’t work right,” he says. 5. Set realistic expectations. Grandiose ideas surrounding speech recognition’s powers may not always translate to reality. Some organizations expect to see productivity gains and improved documentation accuracy in an easy-to-use format. Experts say understanding the technology’s limitations in each of these areas is important for developing a reasonable plan and rollout strategy. “You can’t expect it to be flawless. The reality of speech recognition today is that it’s not going to be 100% accurate,” Fritsch says, pointing out that while the technology can result in improved productivity and efficiency, health care leaders will be disappointed if the wrong expectations are set. 6. Consider the context. According to Fritsch, some physicians tend to go overboard and want to use speech recognition for everything. The bottom line is that workflow should underscore any decision regarding the technology’s deployment. “You have to determine when and where it makes sense and where it doesn’t,” he says. Pointing to the difference between structured text and narrative in the EHR, Fritsch explains that speech recognition often makes sense where narrative is used—a progress note, for example. On the flip side, it sometimes can be faster to use keyboard shortcuts for the structured text used in drop-down menus. The environment also is critical to the equation, Fritsch explains, pointing out that a quiet office naturally will get better results. 7. Choose an appropriate model. Front-end speech methods work well in some scenarios, while other environments are conducive to back-end speech processes where a second set of eyes ensures the content’s accuracy. To combat this occurrence, Kivi suggests changing the workflow to include back-end speech recognition with dedicated editors to create traditional transcribed documents that are then sent through natural language processing to pull the discrete data and autopopulate the appropriate EHR report fields. 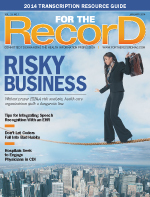 “The result is physician-preferred document creation methods and compliant structured EHR documents,” he says. 8. Take advantage of enhancement tools. Because speech recognition technology primarily is geared to address output in narrative form, front-end speech processes can result in physicians taking time to copy and paste text into structured EHR fields. According to Crandall, this process can decrease productivity gains; however, there are tools available to help physicians minimize the impact. For example, there are enhancement solutions on the market that capture free text narrative from speech recognition dictation and automatically populate it into structured data fields via terminology management features. According to Crandall, these solutions, which bridge the gap between EHRs and speech recognition solutions, have been shown to reduce clickable EHR interactions by up to 80%. — Selena Chavis is a Florida-based freelance journalist whose writing regularly appears in various trade and consumer publications covering everything from corporate and managerial topics to health care and travel.